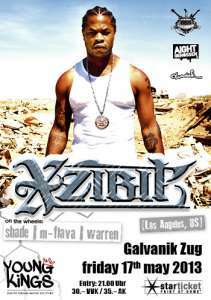 As Xzibit makes his way around Europe during the Gumball 3000 road rally he will be stopping off at Zug, Switerland on 17 May 2013 to perform at Galvanik (info at: http://www.galvanik-zug.ch). Xzibit will also perform at Nouveau Casino in Paris, France on May 22. As Xzibit announces more dates we will announce them to fans via this website on the Xzibit shows page on XzibitCentral.com page and follow us on Facebook or Twitter to be notified when more dates are locked in.